Alex Martin getting some seat time on the new bike before the Montreal Supercross. 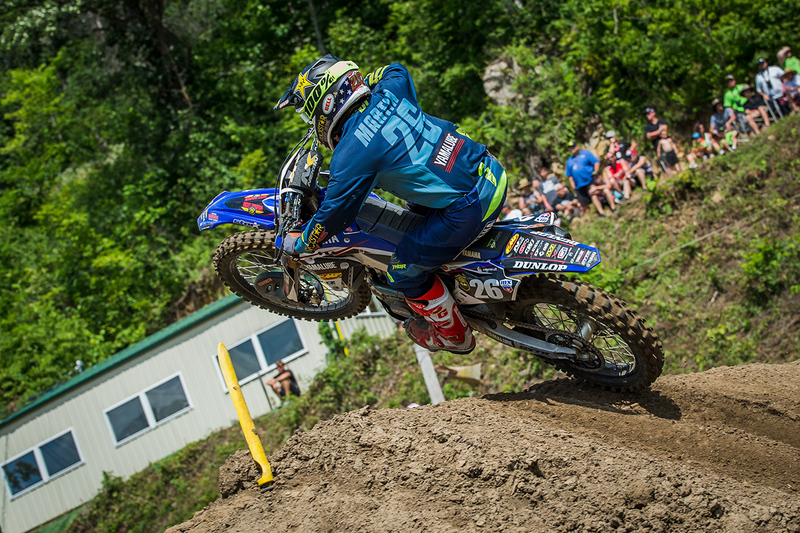 After years spent as a privateer, 28-year-old Alex Martin got his first big break by joing the Star Racing Yamaha 250 team, which also included younger brother Jeremy Martin. After their season together, Jeremy turned to Geico Honda, while Alex moved over to the Troy Lee Designs/Red Bull/KTM team. While his 2017, and 2018 seasons were good, especially this summer with his 2nd overall in the 250 outdoor Championship, something seemed missing. Now joining the Autotrader/Yoshiumra/Suzuki Factory Racing team, the Minnesota native in anxious to get back to racing for wins and championships. We caught up with Alex (affectionately known as big Al) as he was preparing for the upcoming Montreal Supercross. ALEX, LET’S TALK FIRST ABOUT THE RECENT ANNOUNCEMENT ABOUT YOU JOINING JGR SUZUKI. It Is a great opportunity, I now have a two-year deal with the JGR team, and I am just excited about it. I had a great two years with TLD/Red Bull/KTM team, this opportunity came up with JGR, and I just could not pass it up. I am looking forward to another two years on the Suzuki RM-Z 250 with JGR crew. WHEN DID YOU START TALKING TO THEM? I guess everything really started back in June. I would say around High Point time. We had the first three Nationals, I was fortunate enough that I had some good races and was on the podium pretty much through the first three. So that allowed me to get the ball rolling a little bit faster, and the JGR guys offered me a contract back in June. FACTORY SUZUKI HAS NOT REALLY HAD A STRONG 250 RACING EFFORT HERE UNTIL RECENTLY, DID THAT CONCERN YOU? Yes, obviously; I took everything into consideration before we signed this deal. I guess the fact was that Suzuki had not really had a strong effort over in the U.S., but where they had put their money and resources into was over in Europe. Jeremy Seewer and Hunter Lawrence, those guys were getting good results, so I knew that they were definitely taking it serious with recruiting me. I know that they were definitely wanting to get some results, and I was very curious going into it. That made me feel better that they were that serious, and they wanted me. JUSTIN HILL’S TITLE DEFENSE STARTED OFF NOT THE BEST, BUT NEAR THE END OF THE SUPERCROSS SERIES, HE TOOK A PODIUM, AND THEN A WIN. He won San Diego, so that was another factor that came to mind when I was doing negotiations. Outdoors was my grind, and I feel like I can get it done on any bike outdoors, but in Supercross, they had good results with Jimmy DeCotis, Kyle Peters, and Hill who were all on the podium. Alex placed second overall in the 2018 and 2016 in the AMA 250 Outdoor Nationals. I FEEL THAT JGR TEAM MANAGER JEREMY ALBRECHT HAS A MORE PERSONAL RELATIONSHIP WITH HIS RIDERS. IF YOU HAVE A BAD RACE OR TWO, YOU ARE NOT SUDDENLY OLD NEWS. Yes, for sure he is that way. I have known J. Bone for quite a few years now. Back in 2014, the Rock River team had JGR engines and suspension, so I got to know the guys up there fairly well. Obviously, I have not actually been on the team yet, so I cannot really speak to how J. Bone is as a Team Manager. I guess I will let you know next year (Laughter). THE LAST COUPLE TEAMS YOU HAVE BEEN ON HAVE HAD FULL DEALS WHERE ALL THE RIDERS WEAR THE SAME GEAR, SAME BOOTS, SAME HELMET, ETC; WITH JGR NOT HAVING THAT, IS THAT BENEFICIAL TO YOU? Well, for sure that is better for the rider. Definitely, you get that income from a few different companies or sources. My deal was a base salary and I was free to do my own gear, helmet or boot deal. But then for this upcoming year, they ended up doing a gear deal for the team, and I think a helmet deal was with the team. Actually, my salary bumped up according to how much money they get from those companies, so it is the same for me either way. I get a salary increase either way. Some people require more endurance type training. Some people require more sprint power type training, where you just have to analyze every individual, and try to give them a program. That is why I do not think one size fits all approach is the best way to do it. IN SPITE OF FINISHING SECOND IN THE CHAMPIONSHIP THIS YEAR, I DO NOT KNOW THAT YOU WERE OVERJOYED WITH YOUR RESULTS. No, I really wasn’t. When I finished second overall in the series in 2016, my first year on Factory Yamaha Team, that was like exciting. I was winning races and finishing top two in a championship was awesome. You know, last year, we were at second again before I got hurt and that was becoming more normal. And then this year, it was like second in the championship for the third year in a row essentially. That was when it gets a little old. Obviously, I am fortunate for these opportunities that the factory teams get me in, and I can be on the podium. But you can only basically be the first loser so many times. I have definitely been working hard the whole time to try to get that top spot, but it just has not worked. It just has not been in my favor, but that is where it is a fresh start with the JGR guys. A new bike with the Suzuki, hopefully I can get up there on that top step next year and get the job done. Alex back in the Star Racing team. NEAR THE END OF OUTDOORS, IT DIDN’T SEEM LIKE YOU WERE ON THE PODIUM AS MUCH AS YOU MAY HAVE BEEN EARLIER IN THE SEASON; WHY WAS THAT? I think obviously the last three races for me were hugely disappointing. I was lucky that I had such a good strong run and finishes for the first 50-60% of the season where I basically had second in the bag, no matter how terrible I did the last couple races. But having said that, I still wanted to finish out the year strong, and get on the podium. It just seemed like physically I was kind of flat and struggling to find the fire on race day. It was a long season, and I feel like it was starting to take its toll on me for the last couple of races. Where you are just trying to basically get through it, and that is not necessarily how you want to show up on race day. I just did not have quite the fire that I had through the first half of the series. That is something to take into consideration for next year too. I think a lot of it has to do with training, and how we approach the training side too. One minute we are battling each other, and up on the podium, and then the next minute he is in a hospital bed. The initial prognosis was looking a little grim, but fortunately he had surgery, they put two Titanium rods in his back, and he is going to make a full recovery. I HEARD SOMEONE SAYING THAT YOU MAY HAVE STRUGGLED A BIT WITH THE TEAM TRAINING? I guess that is definitely a general thought that when you have ten different guys that everyone is unique genetically, and individually on what they need to make themselves a better racer. It is hard when you have a one size fits all program. I have a lot of respect for Aldon, don’t get me wrong, and what he has done. You cannot deny the championships that he has earned, and his track record speaks for itself. But I am excited about what I have going for next year, and the training. I am going to be training at the Moto Sandbox with rider like Ken (Roczen), Chase and Adam (Cianciarulo) and those guys. I am excited to have a little bit more freedom in my program and train the way I think that suits me. I think everyone is different; some people require more endurance type training. Some people require more sprint power type training, where you just have to analyze every individual, and try to give them a program. That is why I do not think one size fits all approach is the best way to do it. Alex at the JGR facility in North Carolina. YOU ARE NOT SAYING THAT THE BAKER FACTOR PROGRAM IS BAD, BUT ITS MORE A ONE SIZE FITS ALL PROGRAM. Yes, for sure; it is just a fine line. I guess I am just looking forward to moving on, doing my own program, and working on my actual weaknesses instead of just kind of playing on my strength. EVEN WHEN YOU WERE PRIVATEERING IT, YOU WERE ALWAYS FIT. SO, YOU KNEW WHAT TO DO. HOW DIFFICULT WAS IT TO SEE YOUR BROTHER HAVE THAT SERIOUS CRASH? It was not something that is easy to deal with. With that particular injury, when you see your brother in so much pain, it is hard. One minute we are battling each other, and up on the podium, and then the next minute he is in a hospital bed. The initial prognosis was looking a little grim, but fortunately he had surgery, they put two Titanium rods in his back, and he is going to make a full recovery. It was definitely a little challenging to go out there and race weekend after weekend when he is not out there. You know he is hurting and had a serious injury. It was something that was challenging for me this summer to try and basically just push out of my mind more or less. You cannot think about that on race day or even when you are riding a dirt bike. YOUR CONTRACT WAS UP THIS YEAR. ALTHOUGH YOU WERE THE TEAM’S BEST RIDER WHAT HAPPENED? Going into the outdoor series, I had full intentions of staying with the team. I did enjoy it over there. They were like a family. And with two years of being on the podium a dozen times and being in the outdoors championship for two years in a row, I thought that would be enough to have them resign me. But at the end of the day, they had three amateur guys coming up the pipeline, and Sean Cantrell signed for another year, so there was not really any space on the team. This JGR deal was better, plain and simple. It is a better deal and that is what allowed me to go somewhere else. ARE YOU TAKING A LITTLE MORE TIME OFF OR ARE YOU GOING TO BE RIDING A SUZUKI RIGHT AWAY? I took one full week off, a lot of golfing, pizza and beer. I went to the beach and had a good time, but I have been getting back into running, cycling, and getting in shape this week because I am going to go do the Montreal Supercross on September 15th and I am going to race the Suzuki. So, I recently flew up to Charlotte am flying up to Charlotte to ride the Suzuki and get three or four days on the bike before racing in Montreal. Then basically have the rest of September off before we get back to training full-time in October. THAT FIRST RACE IS COMING REALLY QUICKLY. Yes, definitely, maybe not ideal timing, but at the same time, a good opportunity to go. I have never been to Montreal, so it would be a good time to Canada, race, see the city, and get a little bit of time on the yellow bike, race wise. It is going to be a fun off-season. 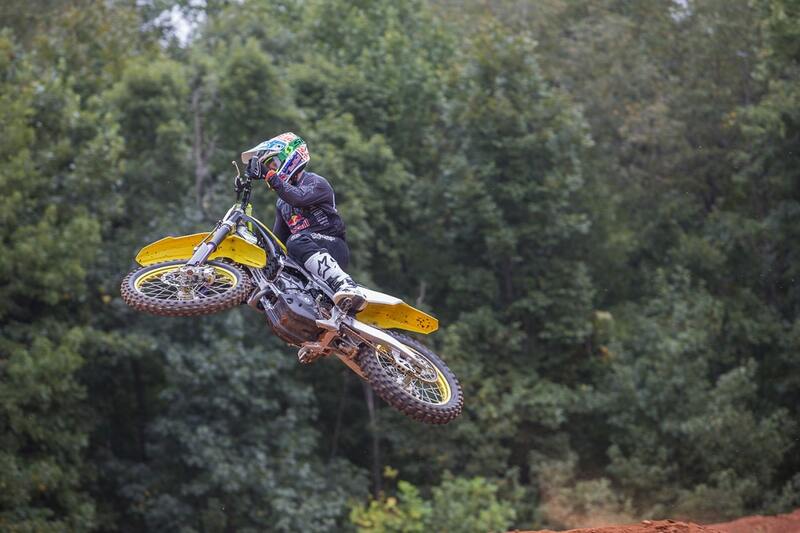 I cannot wait to get on the yellow bike and start to put some moto’s on it. IT MUST BE PRETTY COOL MOVING TO A NEW TEAM, NEW BIKE, AND NEW STRUCTURE. Yes, for sure. I am excited, and I can’t wait. There are a lot of good things ahead, so hopefully we can have a strong off-season, and build up the body and come out swinging next year on the JGR Suzuki.